Nu, for the first time in My Year of 100 Books, I’ve given a book Five Stars. (Is it tacky to reference/imitate the book’s narrative style in reviews? I can never decide). The Chosen tells the story of the unlikely friendship between two teenage, Jewish, New Yorkers. “In grade school, they told me it was about Judaism. […] In middle school, they told me it was about the Holocaust. […] In high school, they told me it was about Zionism. This is perhaps the best way to explain the novel, as while it does feature the first three options very heavily, at its heart it is about the relationships of the two protagonists with their fathers, and each other’s fathers. Even if it is about fathers and sons, as I say, the other three subjects are integral to the telling of that story. If you’re interested in Judaism, particularly Orthodox and Hasidism, this is the best introduction I’ve ever come across. It’s explanatory, but all the theology is well blended into the narrative, which is something that’s so often lacking in religiously oriented fiction. It assumes a basic knowledge of Judaism, and almost everything is easy to pick up from context. It also gives a good narrative history of the founding of Israel, and most powerfully, a fantastic portrayal of how American Jews reacted to the revelations of the Holocaust. If The Chosen has a downfall, it’s that sometimes it gets a bit repetitive, with characters having the same conversations, or snippets of dialogue, more than once, particularly towards the end. This gets a little tedious, especially since everything else that’s going on in regards to plot is so interesting, but that really is my only fault with the story. The copy, on the other hand, is a different matter. As I mentioned in my post on proof-reading, the version I read (Penguin Modern Classics, as pictured above), is not perfect. In addition to the misspelling of Hasidim, I noticed one or two further errors later in the book. It’s not a big deal, I suppose, but my opinion of Penguin has gone down slightly, and I’d definitely think twice about buying another book in the Modern Classics imprint, despite their aesthetically pleasing covers. Despite these flaws, I’d still recommend The Chosen wholeheartedly. In my review of Siddhartha, I commented on the quality of the eBook copy that I read, which included a number of off-putting typographical errors. In that instance, I would assume that it was due to the quality of the digitisation procedure used by the Gutenberg Project. However, since it’s been in the forefront of my mind, I’ve been noticing misspellings and odd grammar more regularly than I ordinarily would (That’s not to say that I don’t normally notice, it’s just that I often get so immersed in the story that I can’t see the trees for the forest, to invert an expression). 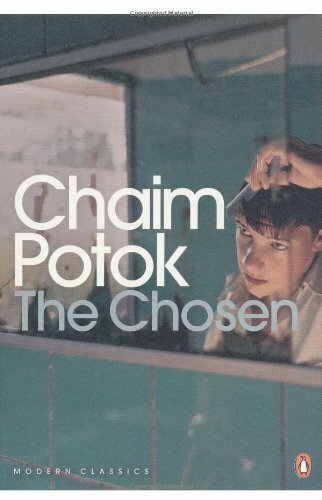 For example, I’m currently reading The Chosen, by Chaim Potok, which features as one of its protagonists, a Hasidic Jew. During a long explanation of the history of Hasidism, (in which the name and its derivative are used many times), at one point “Hasidim” is misspelt as “Jasidim”. It’s just sloppy, and while I’m loving the book, I can’t help but think that it’s a fairly major thing to miss, especially with the technology that is available to a major publishing house such as Penguin. I don’t mean that everything should be written in perfectly regimented academic English, rather that your characters have to speak and think in ways that make sense. Sometimes this can happen when there’s a long gap between books in a series, or if one volume is written by a different author. A particularly good example of this is Douglas Adams’ Hitchhikers’ Guide to the Galaxy. Prose was not Adams’ primary medium, and so over the course of his five books, particularly Mostly Harmless, the last instalment he wrote, the character’s voices vary wildly. This is continued in the posthumous novel And Another Thing, written by Eoin Colfer. Despite Colfer’s engaging personal writing style, he completely failed to grasp either Adams’ own narrative voice (which was at least consistent) or that of his characters, which ultimately ruined the book. The most egregious example I’ve come across, and perhaps the easiest to have changed was Audrey Niffenegger’s Our Fearful Symmetry, which I’d say is one of the worst books I’ve read in a long time. I really enjoyed The Time-Traveller’s Wife, but there was so much wrong with this book, most of which I’m not going to go into. What’s relevant here is that even though most of the book is set in contemporary London, and most of the characters are Londoners who have lived their entire lives in the Hampstead, a particularly posh area, they all spoke American English. Not so much spellings, that was at least localised, but just using phrases that they as characters would never use, like the septuagenarian woman dealing with her mail rather than her post, taking a cab, not a taxi, and riding the subway, not the underground. Nothing big, but enough to pull me out of the book and to be honest it makes Niffenegger look like a second-rate author. It would have been so easy to fix as well; just to get a Londoner to proof-read would have solved one major problem. Of course, the weird scene where one of the characters is perving over an episode of Doctor Who, the frankly bizarre plot twists and unlike-able characters would still have made me hate the book, but at least it would have been more technically well-written. I realise it’s very easy to make mistakes; everyone does, but that’s why publishing houses employ proofreaders, and why I’m still a wary about buying self-published books, because for every author that’s put care and effort into their work, there are ten others with delusions of competence who haven’t put the necessary work in. 1 I guess that technically this isn’t strictly “proofreading”, as it has little to do with the proof of a manuscript, but in common parlance I think it’s covered.